Whether you travel a lot or want to get ready quickly with the least amount of products possible, double-duty cosmetics are a lifesaver! Recently I discovered Ecco Bella Beauty - a line of all natural and organic makeup - and they have some fantastic finds to suit this very purpose. Today we will look at one of their versatile blushes and two gorgeous Shimmer Dust powders. Ecco Bella's powder products come in pans that can be used in their paperback compacts which are sold separately. You can put everything from eyeshadows to face powders in these convenient compacts. They come with mirrors so they are perfect for on the go! 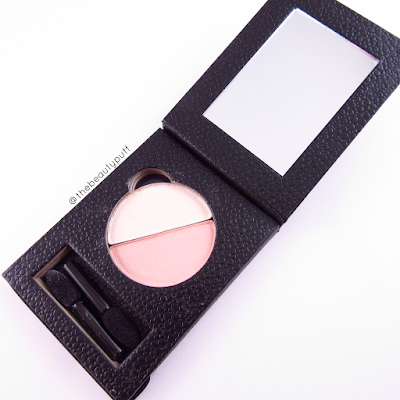 The blush I have is in the single compact (square) and the Shimmer Dust powders are in the single compact with well (rectangle), which also has space for the sponge applicators that come with each eyeshadow refill. Now, on to the products! 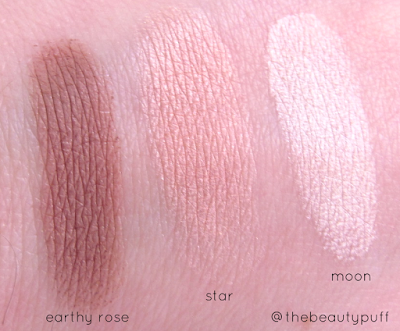 The Earthy Rose blush is one of the deeper shades in the collection. 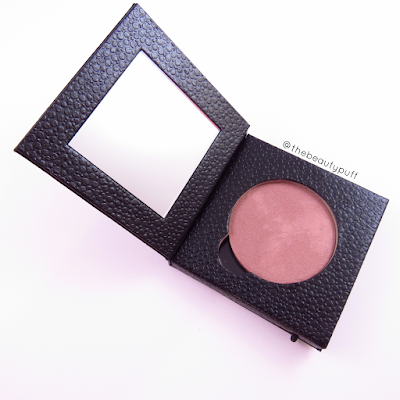 It has a gorgeous brownish rose tone that looks beautiful on the cheeks as well as on the eyes. The color is very pigmented so you do not need a lot! A lot of powder gets "kicked up" with a brush so I suggest gently tapping into the product rather than swiping. When applying this product as a blush, you may want to use a duofiber brush at first so you pick up minimal product. It blends beautifully so if you happen to go overboard at first (like I did), you can continue blending to achieve an even application. It is beautiful all on its own and can be used for overall warmth without need for additional products. When used as an eyeshadow, you can see more of the slight shimmer and rosey undertone - perfect for fall looks! The Shimmer Dust powders come in a variety of colors to suit different skintones. I have Moon (top) and Star (bottom). These powders can be used as highlights on the cheeks or brow bone, as well as eyeshadows. Moon is perfect for an inner corner highlight or all over brightening shade. Star is a stunning light pink that I love wearing on the lid. You can also wear it with a pink blush for additional luminosity. As you can see from the swatches below, these colors are all very pigmented. When blended out, they provide a subtle glow. I love each of these colors individually but also combined them into one easy look! Earthy Rose was not only my blush, but also provided depth in my crease and definition on my lower lash line. Star brightened my lid and Moon provided the perfect inner corner and brow bone highlight. It was stunning and so easy to achieve in a few simple steps!